Despite years of people claiming that “email marketing is dead,” it still remains one of the strongest drivers of ROI in digital marketing. From small businesses to large corporations, email marketing is a key driver in successful online sales. 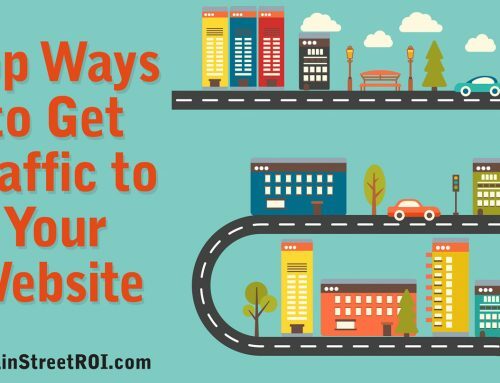 When I say successful, I mean that on average, email marketing sees a 122% ROI. Doesn’t seem possible, right? Well, it’s completely possible. There’s a lot of misinformation about email marketing. So, in today’s article, I’m breaking down some of the key myths surrounding email marketing to help you better understand what’s true and what’s not. The only reason many business owners aren’t taking advantage of email marketing is that they don’t realize its effectiveness. Here are some key stats about email marketing that might surprise you. Email marketing has 4x the ROI as social media. Remeber, the average ROI on email marketing is 122% versus only 28% for social media marketing. 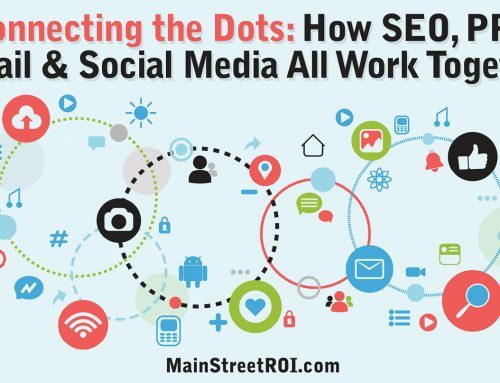 People who click through to a website from an email are more likely to buy when compared to people who are going to a website from a search engine or social media. Most consumers (72% of them) prefer to receive promotional offers in email rather than on social media. Email has a conversion rate of 66% when compared to direct mail, social media, and search engine marketing. Email is 40 times more effective in acquiring new customers. So, as you can see, email marketing IS effective. Let’s continue slashing through some other myths about email marketing. I completely understand that it may be overwhelming to think about creating emails on a regular basis to send out to consumers and past customers. It doesn’t take as much time as you may think, though. There are many affordable email marketing automation tools that can help you generate impressive and effective emails. With these tools, all you have to do is drag, drop, and type in some text. You can create templates, so you can duplicate them and then change the message you want to send. This can significantly cut down on the design work and time. You will be surprised at how easy it can really be to create quality email marketing campaigns using these tools. Spend just a couple of hours creating an email campaign and you can set it up to send the emails at defined times. That way, you are free to move on to doing other tasks that are important for your business. As you’re developing your emails for your campaign, you will likely feel the urge to keep the subject line text short. This is a common misconception. It makes sense because most people don’t have time to read, right? Well, with email marketing, you need to get people’s attention in a different way. You actually have to make them curious with longer subject lines. Take a look at this image from Return Path. 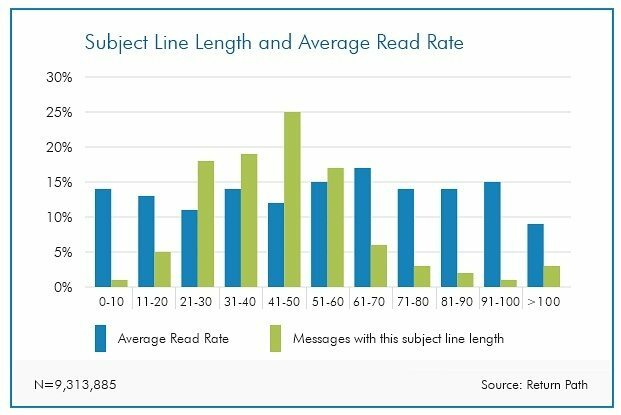 You can see that the read rate is highest for emails with 61-70 characters. What’s fascinating is that not many marketers are making their subject lines that long. You can get ahead of the game by increasing the length of your subject lines. Go ahead and try it. Studies have been done over and over again showing that one day is better over another day to send promotional emails. Each of these studies contradicts the other one. You can find a study that shows you that any day of the week is better than another one. This myth is somewhat true, in that there is likely a best day for your business to send emails. However, that day might be different from the business next door to you. The key thing to understand here is that there isn’t any one day that is best to send emails for every business. You need to know your audience and what works best for them. For example, if you’re marketing B2B, it’s likely that people will be more likely to click on your email during the workweek rather than the weekend. You know your consumers best. Send out email campaigns based on what you believe is the best days and times, and then track the results. With careful tracking, you’ll come up with a schedule that helps you know the best times. Again, this myth is both true and not true. It’s true that people nowadays are inundated with promotional emails, and they do ignore some of them. What you need to keep in mind is that they do see those emails when they hit the delete button, and they only hit that button because the subject line or email text didn’t capture their attention. That’s just for that one email. Have a purpose. Why are you sending out your email? If it’s just for the sake of sending, then it’s probably not worth doing so. But, if you have an exciting promotion happening or if you wrote a great blog article that you think people would like to read, then it makes sense to send out the email. Offer quality content. Make sure that there is value in the emails you are sending. If every email you send offers some type of benefit to your subscribers, then the amount of emails you send doesn’t matter as much.